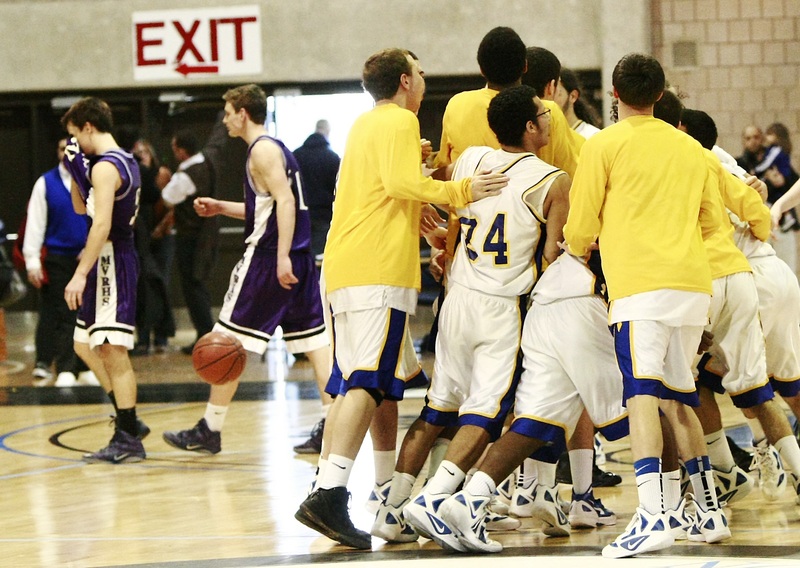 Wareham celebrates while Vineyard shown exit. BOSTON — The Vineyard boys’ basketball team’s successful season came to a close Saturday, as the team came back from an early 16-point deficit but fell just short, losing 70-65 to undefeated Wareham in the division 3 south section championship game at UMass Boston. The loss also ended a dream year for all four of the high school’s winter teams. The boys’ and girls’ basketball and hockey teams all made their post-season tournaments. Boys’ basketball was the last one left playing until Saturday. The Vineyarders, seeded second in the tournament, ended their season at 21-3 before a large, boisterous contingent of Vineyard fans. The Wareham team held the lead for the entire game. The Vineyarders tightened the gap, though, and ended the first quarter down 21-12 after a 9-0 run. By halftime, the score was 41-32, and a third quarter three-pointer by senior Delmont Araujo brought the game to within two points, 48-46. The third quarter ended with Wareham leading 52-46. Junior Jack Roberts, scoring in the fourth quarter, lifted the Vineyarders to within three points, at 59-56, with three and a half minutes remaining. The team played without Senior Izak Browne during the second half, after he left the court with a hip injury at the beginning of the third quarter. “That really hurt us, not having him for second half,” Mr. Joyce said. He cited senior Charlie Everett’s 22 points, a personal best, as a big factor in the team’s effort. In assessing the entire season, he praised the team as the best the high school has had in almost 40 years, with a great group of seniors and talented players that played well together. “It was fabulous,” Mr. Joyce said of the hometown crowd, some of whom took early morning ferries to get to the game. All four winter sports teams made it beyond the preliminary rounds of their tournaments before losing. (Boys’ hockey had a bye in the first round.) The girls’ hockey team made it to the postseason for the first time. Wareham was knocked out in the next round of tournament play, the state semi-finals against Danvers earlier this week.